Wooster Pro Nylon/Polyester paintbrushes are made with the very best materials. This unique filament blend was formulated to deliver smooth flow and carry more paint to the end of the brush for fine finishes while achieving it fast. They are designed to provide control and produce sharp lines making these brushes ideal for cut-in work and precision painting. The Amerock BP36547G10 Wells 3-3/4in(96mm) CTC Pull is finished in Satin Nickel. True elegance never needs to raise its voice, and the Wells Collection captivates without a word. A perfectly balanced silhouette flirts with the angled edges of a gemstone cut. The classic Satin Nickel finish provides a sleek, lightly brushed, warm grey metallic look. The Amerock BP36549G10 Wells 5-1/16in(128mm) CTC Pull is finished in Satin Nickel. True elegance never needs to raise its voice, and the Wells Collection captivates without a word. A perfectly balanced silhouette flirts with the angled edges of a gemstone cut. The classic Satin Nickel finish provides a sleek, lightly brushed, warm grey metallic look. The Amerock BP36550G10 Wells 6-5/16in(160mm) CTC Pull is finished in Satin Nickel. True elegance never needs to raise its voice, and the Wells Collection captivates without a word. A perfectly balanced silhouette flirts with the angled edges of a gemstone cut. The classic Satin Nickel finish provides a sleek, lightly brushed, warm grey metallic look. The economy 1 in., 2 in. and 3 in Foam Paint Brush Set (9-Pack) is ideal for crafts and hobby paints, touch-up work and stains. These brushes are made with high-density foam pads and solid wood handles. They provide quality at a value price. 2-1/2 in. 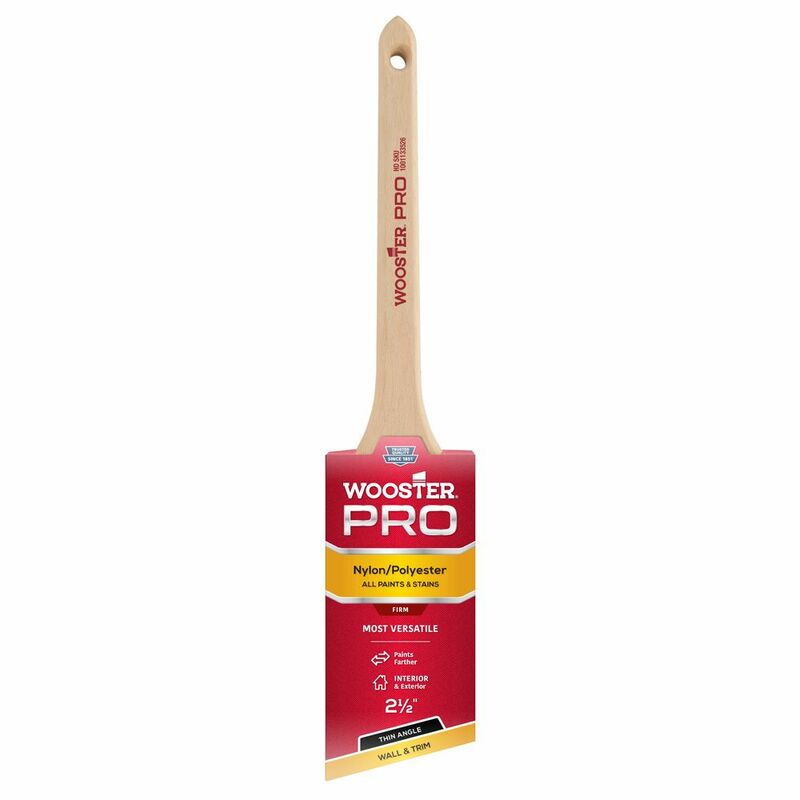 (65mm) Wooster Pro Nylon/Polyester Thin Angle Sash Brush Wooster Pro Nylon/Polyester paintbrushes are made with the very best materials. This unique filament blend was formulated to deliver smooth flow and carry more paint to the end of the brush for fine finishes while achieving it fast. They are designed to provide control and produce sharp lines making these brushes ideal for cut-in work and precision painting.